when luck, joy and love are just around the corner.. Recently, I was baking for a birthday and instead of making one cake, I decided to make three. Each of them was supposed to carry a birthday wish. I wanted to wish love, laughter and luck.. the three Big L’s.. the plan was good, but when I started to write the words on the cakes, I realized pretty fast that laughter might be too long for these little cakes. I decided to replace this word by “joy”. Joy, laughter.. it says the same 🙂 I was hoping that the cakes bring some luck, because only when we are lucky love will reveal itself to us and we can enJOY our lives. Also, you might wanna add some more milk and maybe some fruit. I have to admit, it was a little too dry. If it still comes out dry, the topping should help. 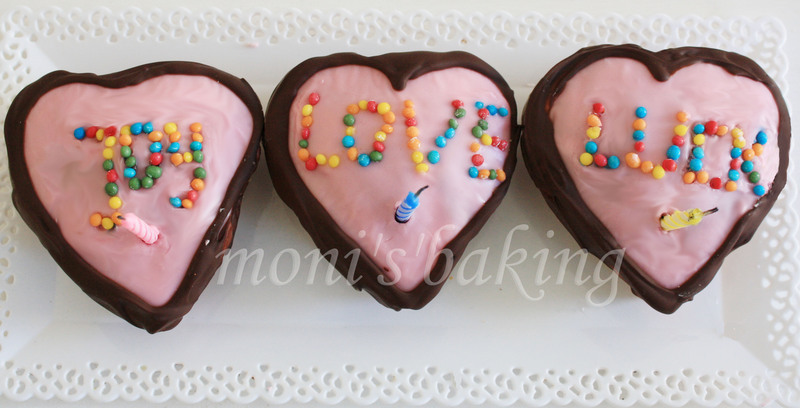 I took chocolate for the heart frames and lemon juice with powdered sugar and red food coloring for the center. The letters I made out of nonpareilles. Like I said.. I needed to adjust the words a little to the space on the cakes, but there is lots of room for creativity 🙂 EnJOY!